Milton Ave. & Roswell St.
A Southeast Tourism Society Top 20 Event for 2018! 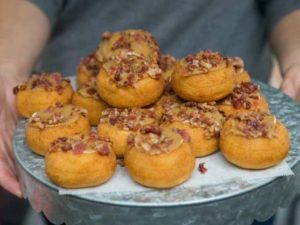 Taste of Alpharetta has become an annual tradition for festival goers, families and food connoisseurs. Mark your calendars to dine in Downtown Alpharetta at over 60 restaurants in one fun night. Sample delicious appetizers, entrees and desserts from the top chefs in town. Enjoy culinary demonstrations, activities for all ages and entertainment to please every palate. Admission is free, you may purchase food tickets on site at our ticket booths for $.50 each. Restaurants participating in the Taste of Alpharetta will not accept cash (tickets only). Restaurants charge $1-3 per food sample. The Music Stage will have harmonic rock/folk/R&B bands. A separate Culinary Competition Stage will pair top area chefs against one another in five categories – Best Appetizer/Salad, Best Fast Casual, Best Fine Dining, Best Presentation and Best Dessert. Award winners are presented on the Main Stage at approximately 8:30 p.m. Vote for the People’s Choice Award at the Culinary Competition Stage prior to 7:00 p.m. Party with Metro Atlanta radio stations. Play at the fun zones. Come out and enjoy Alpharetta’s premier dining experience!